Understanding the customer experience is of the utmost importance to your business. If your application involves multiple stages, you need to know if most customers are progressing through the entire process, or if they are ending the process at some point. The progression through a series of steps in a web application is known as a funnel. 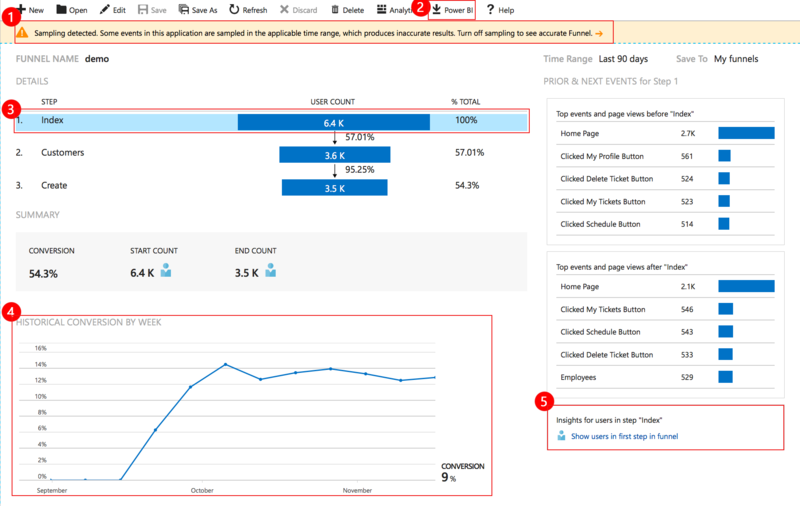 You can use Azure Application Insights Funnels to gain insights into your users, and monitor step-by-step conversion rates. Before you create your funnel, decide on the question you want to answer. For example, you might want to know how many users are viewing the home page, viewing a customer profile, and creating a ticket. In this example, the owners of the Fabrikam Fiber company want to know the percentage of customers who successfully create a customer ticket. Here are the steps they take to create their funnel. In the Application Insights Funnels tool, select New. From the Time Range drop-down menu, select Last 90 days. Select either My funnels or Shared funnels. From the Step 1 drop-down list, select Index. From the Step 2 list, select Customer. From the Step 3 list, select Create. Add a name to the funnel, and select Save. The following screenshot shows an example of the kind of data the Funnels tool generates. The Fabrikam owners can see that during the last 90 days, 54.3 percent of their customers who visited the home page created a customer ticket. They can also see that 2,700 of their customers came to the index from the home page. This might indicate a refresh issue. If your app is sampled, you will see a sampling banner. Selecting the banner opens a context pane, explaining how to turn sampling off. You can export your funnel to Power BI. Select a step to see more details on the right. The historical conversion graph shows the conversion rates over the last 90 days. Understand your users better by accessing the users tool. You can use filters in each step.